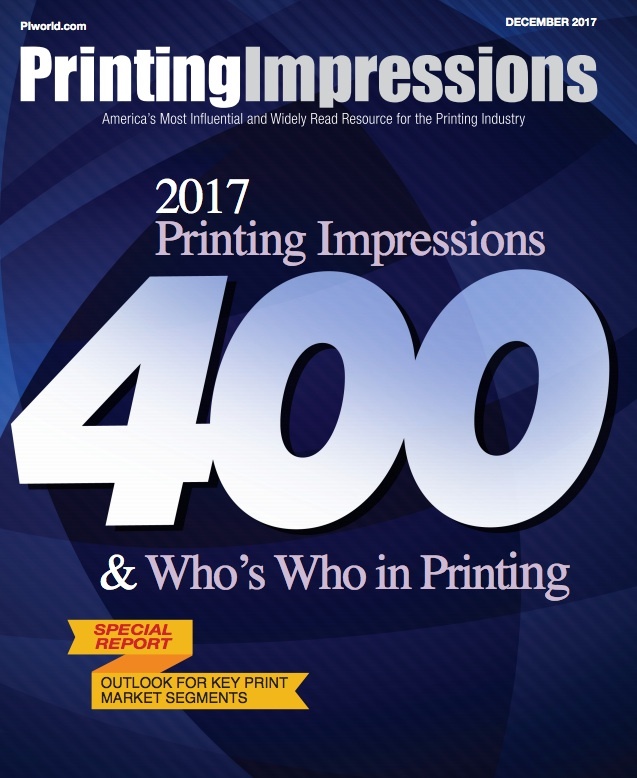 The editorial team here at Printing Impressions is proud to present the 2017 Printing Impressions 400 ranking, the industry’s most comprehensive and insightful list of the leading printing companies in the U.S. and Canada ranked by annual sales. Not only does our 34th annual PI 400 compilation provide recognition to all of the companies that appear among the rankings, the list draws wide interest and scrutiny from print buyers and procurers, marketers and brand managers, industry suppliers and analysts, as well private equity firms, fellow printing companies and other buyers and sellers. The 2017 PI 400 rankings also offer a glimpse at how the printing industry as a whole is performing and evolving - whether through consolidation and M&A transactions, by determining the market leaders in key print market segments, and chronicling the adoption of new technologies/processes. One major trend, based on the 2017 PI 400 data, shows that companies with select market specialties - like direct mail, book manufacturing, wide-format digital and package printing - have grown their revenue streams the most, both organically and through consolidation activity. Additionally, midsized companies on the PI 400 continue to report M&A transactions, including tuck-ins, in an effort to increase or maintain their sales and customer bases. Following the 2016 break up of RR Donnelley into three standalone, publicly held companies, RR Donnelley, LSC Communications and Donnelley Financial Solutions can all be found among the top 10 companies on this year’s list. Although sales have remained flat for all three companies, LSC Communications by far has been the most aggressive from an M&A standpoint in 2017. To view the complete 2017 Printing Impressions 400 (PDF), click here. Not Listed in Our 2017 Rankings? If your company should have appeared on the 2017 Printing Impressions 400 but did not, let us know for next year’s list. Write to: Printing Impressions, Attn: Digital Editor, 1500 Spring Garden St., Suite 1200, Philadelphia, PA 19130 or email jgreenbaum@napco.com, and we’ll add your firm to our database to be contacted for inclusion in next year’s ranking.